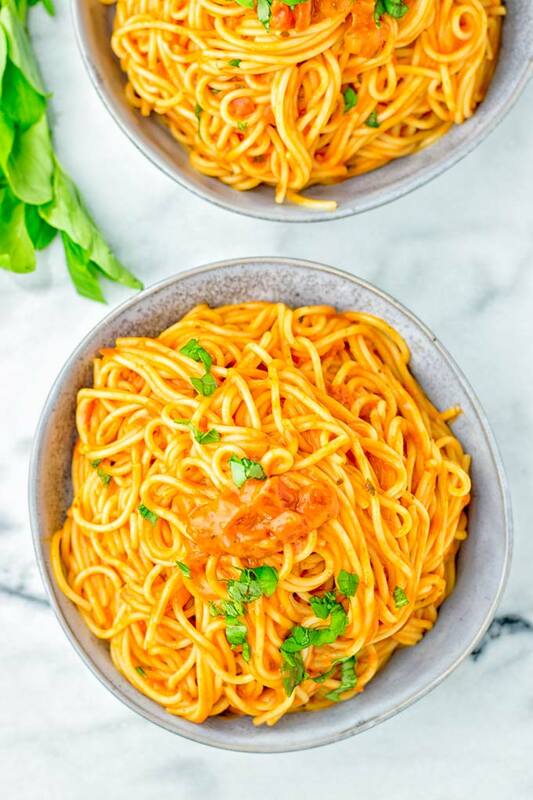 These Instant Pot Spaghetti with Simple Tomato Sauce are super easy to make and ready in under 10 minutes on the table. It’s one of those such delicious quick meals that is so kid friendly and perfect for family dinner ideas. Entirely vegan, gluten free, super creamy, and satisfying. 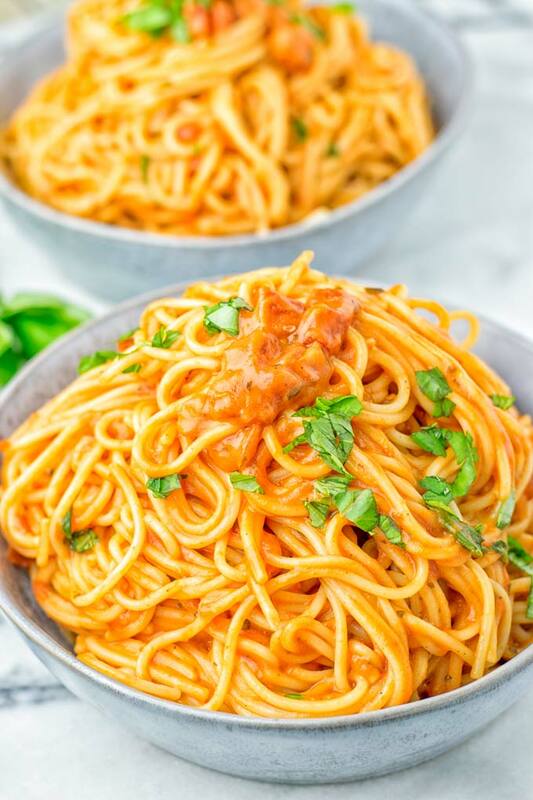 Just put your spaghetti noodles and the spaghetti sauce ingredients in the instant pot and you are good to go. I’m always on the hunt to keep things really easy and go often for one pot meals like this Moroccan Chickpea Lentil Soup (Harira). 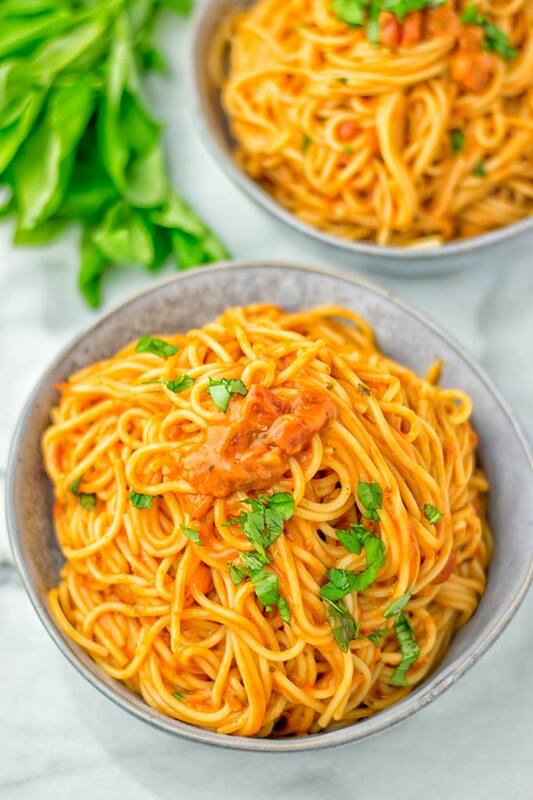 Now it’s even easier with this Instant Pot Spaghetti with Simple Tomato Sauce. It’s ready in under 10 minutes, hearty, super easy, packed with many amazing flavors, comforting, filling, super satisfying, incredibly easy. Plus it’s amazing if you’re one of those people who love their instant pot, but don’t know where to start. This is seriously one of the vegan instant pot recipes that you can start in no time. An instant pot is super versatile. It’s a multi cooker and has many functions. You can use it as slow cooker – so there isn’t any need to have a separate slow cooker if you like this cooking method. But that’s not all. Additionally you can use it as rice cooker, electric pressure cooker, steamer, can steam your veggies and potatoes and more. It does everything for which you normally need seven kitchen appliances. If you already have this appliance, you know how it goes. If not, don’t worry. You have to choose the right settings and can expect everything to go smooth. 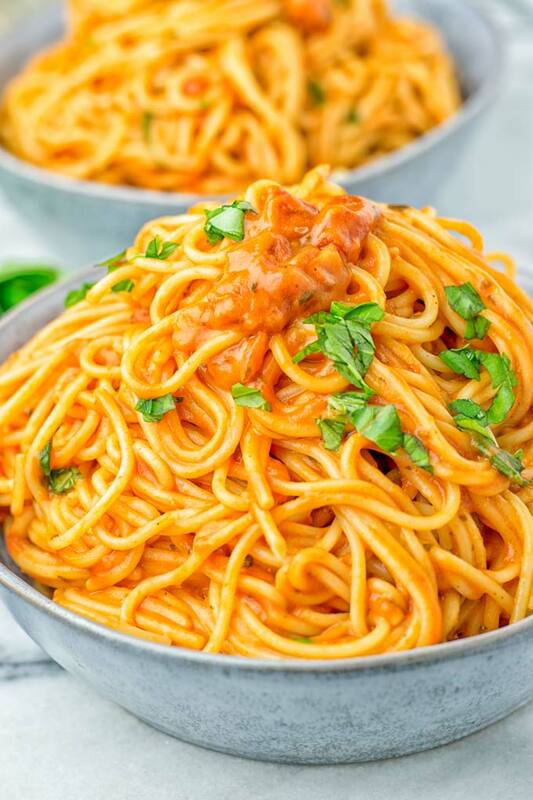 Lucky you, you have this Instant Pot Spaghetti recipe and know exactly where to start. I will tell you exactly what to do and it’s ready in under 10 minutes on the table (not including the time which it takes for the instant pot to reach high pressure which is usually 10 minutes). Add all the ingredients, including the optional nutritional yeast if you like, in your instant pot. Make sure to break your spaghetti noodles in half, season with salt and pepper. Pro tip: just keep it really simple and don’t stir the ingredients, just add everything. 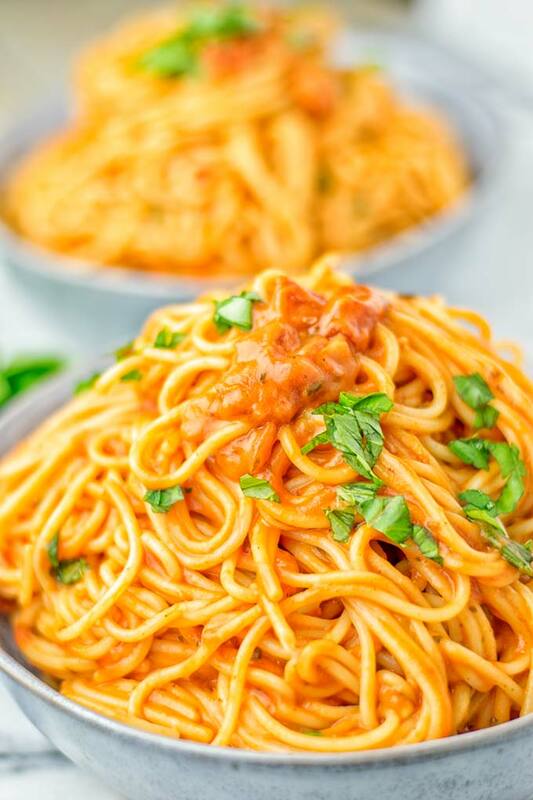 Also make sure your pasta is complete covered with liquid, otherwise use a spoon to push your spaghetti down. Next: Seal your instant pot, use the manual mode and set to high pressure and 8 minutes cooking time. Note: 8 minutes are the absolute cooking time not including the time which it takes for the instant pot reach to high pressure. This usually happens within 10 minutes. Finally and last: After the 8 minutes cooking time, use quick release, and open the instant pot. Now stir the spaghetti with the sauce. Don’t forget to turn off the pressure cooker. Serve on plates or bowls, enjoy. This makes such an amazing and easy dish for dinner, lunch, work lunch and it makes even meal prep a breeze, because it’s s done in under 10 minutes cooking time. I can imagine it’s also really delicious for date night, pot lucks, and so much more. You probably know there are different sizes available. For me I find the instant pot 6 quart ideal, it’s not too small and not too big. 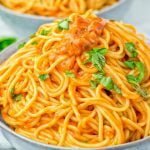 If you give these Instant Pot Spaghetti with Simple Tomato Sauce a try, let me know what you think on Instagram or Facebook. I can’t wait to see all your remakes. 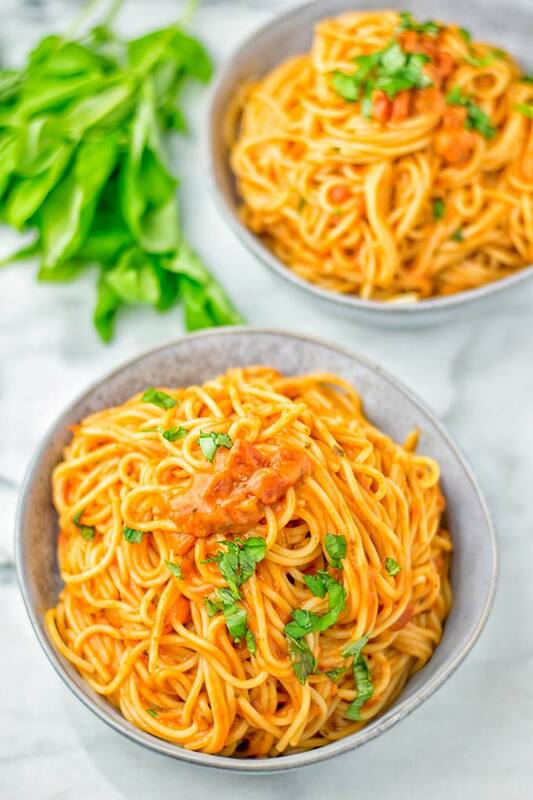 These Instant Pot Spaghetti with Simple Tomato Sauce are super easy to make in the instant pot and ready in under 10 minutes on the table. It’s one of those such delicious quick meals that is so kid friendly and perfect for family dinner ideas. Entirely vegan, gluten free, super creamy, and satisfying. Add all the ingredients, including the optional nutritional yeast if you like, in your instant pot. Make sure to break your spaghetti in half, season with salt and pepper. Don’t stir the ingredients, just add everything. 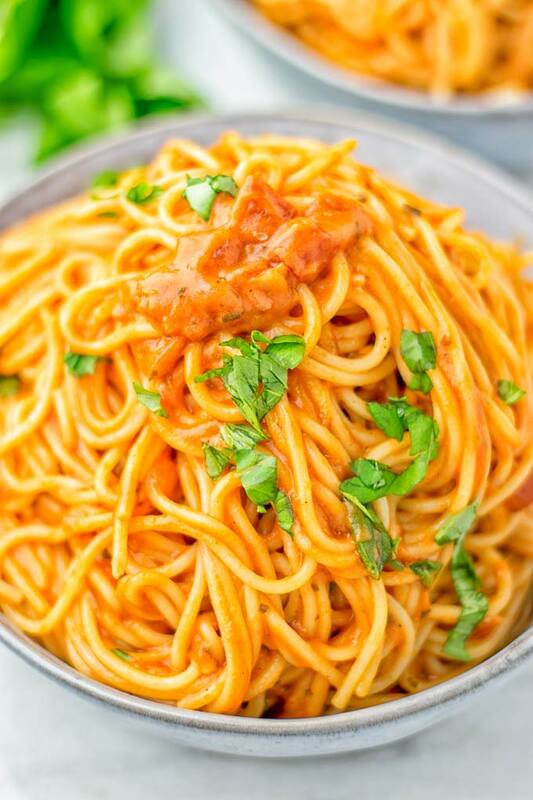 Also make sure your pasta is complete covered with liquid, otherwise use a spoon to push your spaghetti down. Seal your instant pot, use the manual mode and set to high pressure and 8 minutes cooking time. After the 8 minutes cooking time, use quick release, and open the instant pot. Now stir the spaghetti with the sauce. 8 minutes are the absolute cooking time not including the time which it takes for the instant pot reach to high pressure. This usually happens within 10 minutes.